For this How To I’m assuming you are using Windows 8.1 and the Start screen. Go down to the lower right corner to open up the Charms menu then go up to Settings. Next, click on Change PC Settings at the bottom to open up the PC Settings app. Now go down to Search and Apps and open it. 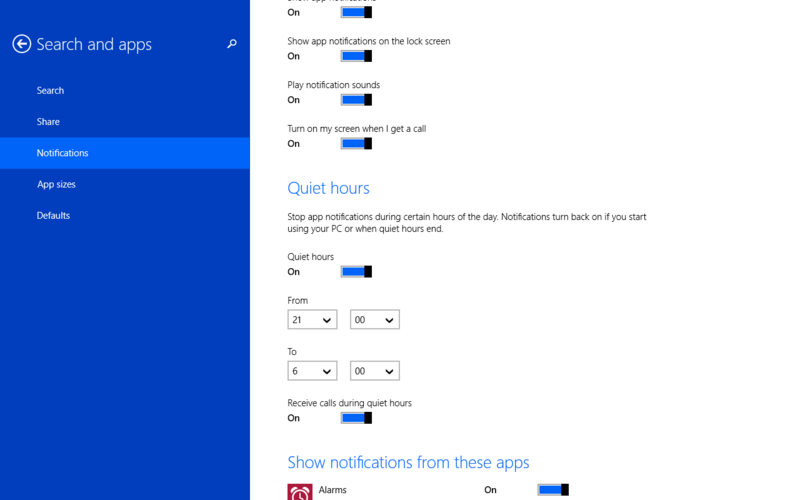 Within this part of PC Settings there are quite a few adjustments that you can make around notifications like when sounds are played or if app notifications are displayed on the Start screen. The middle section of the page is Quiet Hours. case, I like to have things quiet down about 21:00 (9:00 PM) and start going again around 6:00 in the morning. So when I do wake up my PC, all of my notifications about email, Facebook and Twitter are there on my Lock Screen waiting for me. Now obviously Quite Hours is designed for those who keep their PCs on at night or want to have a designated quiet time during their work day to have some peace and quiet. It’s kind of nice not having email chimes going off all the time! To be fair, the only time I really need Quiet Hours on my PC is when I’m traveling. Often I’m in a one room hotel room with my phone and PC and I don’t want to be disturbed by emails coming in at all hours (I work for a multinational in my “day” job so I literally get email at all hours). Otherwise, when I’m at home, the PC is in another room so I don’t hear it. To each his own but the point is that you can set this up if you need to pretty easily on your Windows PC. For more How To’s, be sure to check our my How To pages here on the site.